2.1 Small fonts even smaller? 2.2 Georgia, OK. But Helvetica !? 2.3 Black text on white, why not black text on light grey? 2.14 "...to improve readability, accessibility and consistency." 3.1 What browser (etc.) are you using? 3.13 Order: beta feature bug? 3.18 Where I can test it? 3.19 What is this called? 3.22 Where are the changes documented? 3.26 Improvements for audio usage of the page ? Georgia, OK. But Helvetica !? 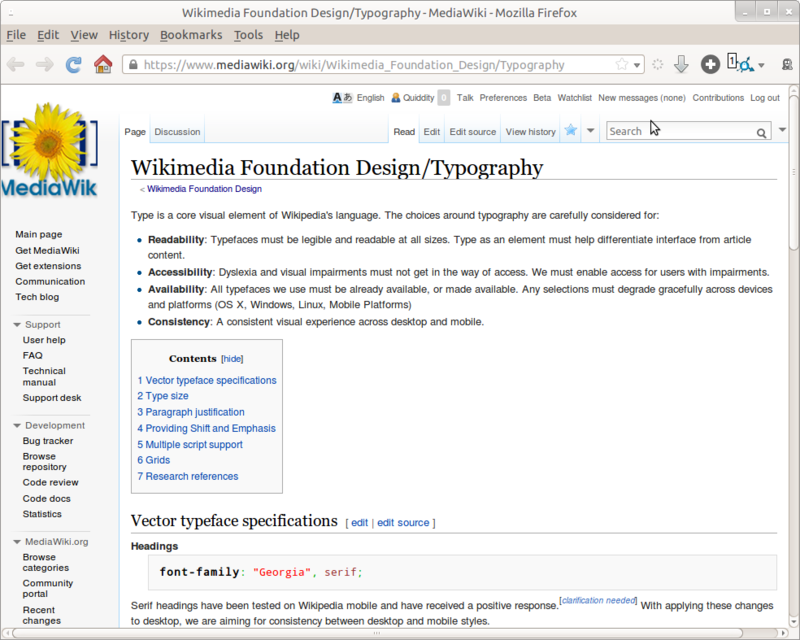 While Georgia and Helvetica are fonts optimized for the web, we can see that body gracefully degrades to Arial because it is freely available on nearly every computer and operating system while being a screen-friendly typeface. Helvetica, and most of its clones like Arial or Nimbus Sans L, are not optimized for screen reading nor for the Web. Its original intent was signage which is the complete opposite of tiny sizes on screen. Its closed counters make it harder to recognize or distinguish some letters. There are much better options out there, Liberation Sans or Arimo (Croscore fonts) are already a bit better, but I’d recommend Source Sans Pro or Noto fonts (a variation of Droid Sans) both with more open and legible designs, fully optimized for screen reading and larger coverage. All these are available as web fonts, can be hosted on Wikimedia servers or are available on Google Fonts. Helvetica and its clones should only be fallbacks not first choice. Full disclosure: I work in the digital type design industry, and am a co-lead on the DejaVu Fonts project, DejaVu Sans LGC would be a possible option however it is not yet fully optimized for screen as some characters are still unhinted, DejaVu Sans is available on most Linux systems. Black text on white, why not black text on light grey? Running text should be have a high contrast, and the common colour-blind combinations should be avoided in conveying information. That is essential readability. But accessibility doesn’t mean tailoring the site for a specific reader’s needs. Particular readers may require black-on-white, white-on-black, 36px text, or something else, and all websites aren’t about to accommodate this. If your needs are unusual, find the accessibility controls on your computer or device. They let you increase text size, change contrast, eliminate colour, invert the display, or read text aloud. Hey all. For those not familiar with it, we have a public design mailing list, which you're welcome to join. On there, I made a proposal which so far has had support from several people. Basically, I am in agreement with the goal to focus on page content as the first priority, but I also agree with the objections to the smaller text size and the color changes for the sidebar and personal toolbar. My proposal is that we give more focus to content by making the main content text have a larger size of 1.1em, and leave the rest of the UI (toolbars, sidebar, footer, etc.) at .8em. I think others here have said they would prefer to see us increasing base font sizes rather than making anything smaller. I would be happy if the body text size were the browser default of 16px instead of the current 13px. They are clearly sidebar nav menus, if you’ve used the web for an hour. Anyone who is actually seeing a web browser for the first time in their life can determine that this is a nav menu by the way it looks, by its text, and by its behaviour on mouseover in about three seconds. Visual emphasis. Blue links are coloured blue to differentiate and draw attention to themselves by their hue, chroma, and lightness, in contrast to surrounding text. But the sidebar navigation does not benefit from this. Its nature is already evident from its elements’ size, position, and arrangement. In a visual design, any unnecessary emphasis is a distraction, and detracts from the design’s objectives. No, seriously. Titles are even often sans serif in print. You should not be mixing serif titles with sans serif main fonts. It just looks wrong, as wrong as Cologne Blue or Modern. Printing the headers in serif and the actual paragraphs in sans seems wrong to me. I would prefer it the other way round, as it is done in most books, journals, newspapers — and for good reason: While the heading is clearly readable in its own self due to its larger size, sans is appropriate. However, it should be at least possible to switch from sans to serif for the article's paragraphs, since multiple lines of text are just better legible when printed with serifs. Since resolutions are ever-increasing, nowadays I find serif to be a valid way to display text on web pages. I absolutely loathe the mixing of serif and sans-serif as it's done in the typography refresh. My objection isn't merely aesthetic — I feel the conflicting styles break the "cohesiveness" of the content. 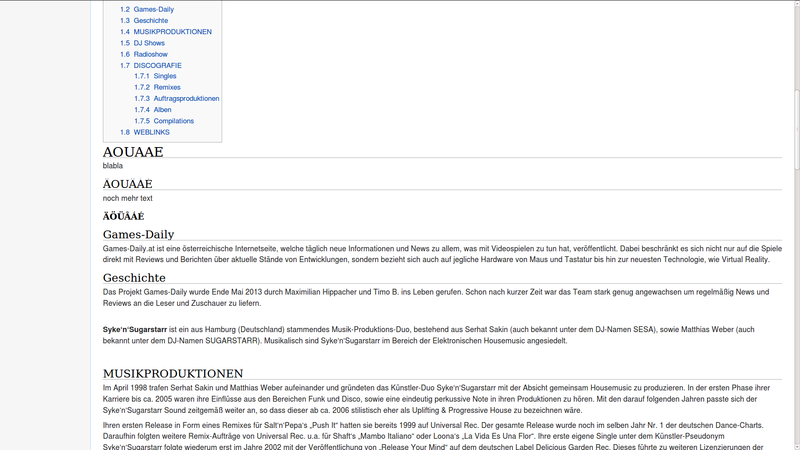 In the Wikipedia style, headings are frequently repeated in the body content below. This occurs at the top of every article, as well as in many sections, especially those that were created from an article merge. When the body content is set in a font similar to the heading, that repetition automatically connects for the reader; it's subconsciously "noticed" without interrupting the flow of reading. With the new, clashing typefaces, the association between the repeated term and the heading is less fluid, and the reader can be jarred into consciously observing and resolving the dissimilarity. It's subtle, and it certainly doesn't occur all the time or for everyone, but it's one of the factors behind the Conventional Wisdom™ that serif and sans-serif typefaces shouldn't be mixed. The fonts are too small. Without the Typography Update they're right on the edge of being OK size, but with it enabled I have to Ctrl-+ zoom once. The sans-serif [edit | edit source ] next to them grates. There have been various experiments to make these a rollover (e.g. http://unicorn.wmflabs.org/navmod/ ) or a pencil icon. The h2 in the TOC box shouldn't be serif; there are probably other semantic headings that should not be serif. The .mw-panel for the left-hand nav is much narrower than the gray column it's in, it wastes a lot of space on the right. If you really want it this narrow, make the div#content's margin-left 10em to give the content more room. The divider lines above the left-hand nav's h3 headings have hard right edges instead of fading out as they did before. "...to improve readability, accessibility and consistency." The typography refresh feature is describes as, "Updates typography of the Vector skin to improve readability, accessibility and consistency." No doubt the creators of the feature believe it "to improve readability, accessibility and consistency". But is there any evidence or heuristic to support the claim? I turned it on expecting to (somehow) do what is says on the tin. I'm now turning it off precisely to restore "readability, accessibility and consistency". From a glance at the plugin page, I don't think I'm alone in questioning it's logic or the objectivity of the claim. What browser (etc.) are you using? 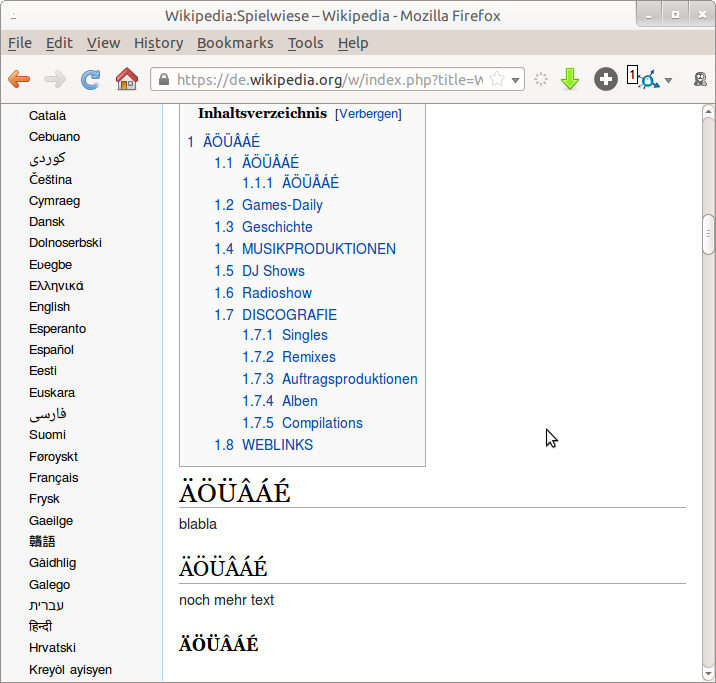 Screenshot of the sidebar at Portuguese Wikipedia after the typography refresh. The H1 has a relative font-size: 1.8333em (=26px), but an absolute line-height: 22pt (=29px). On my machine, the underline bites into the text descenders already. On sv-wikt we make frequent use of an H2-heading immediately followed by an H3-heading, so we've made the space between the two smaller than default. The typography update causes that space to re-appear, since it adds a large margin-top (on e.g. H3), rather than keeping the margin-bottom (on e.g. H2). 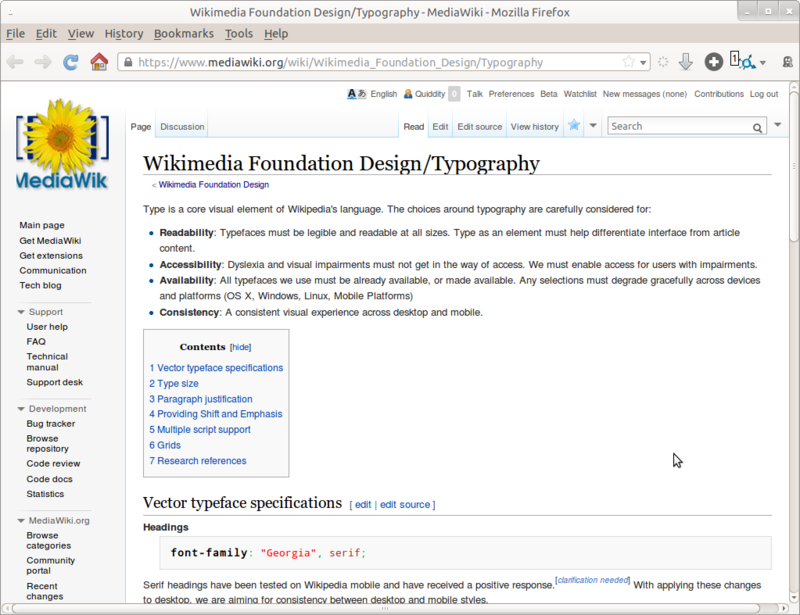 There looks like to be an issue between Wikibase and Typographic refresh beta option: Wikibase item label, in view and edit mode, looks very big when the option is activated. About Beta Features still says “This feature is now scheduled for release by November 14.” But it hasn’t been released as of Nov 14. I'd also love to test it. Today is not the day? The Beta Labs link above sends me to a page with unstyled text. Also, I'm looking at the thumbnails on the beta-features opt-in page and the graphic (though faint) suggests a searchbox at the top of the screen instead of the current at the side. Is this coming? To make the body text the browser default font-size, put the following in your vector.css. This is changed slightly from before the refresh. Where are the changes documented? Of the top 10 Alexa sites that I could access, 5 have menu navigation links in black or grey (Google, Facebook, YouTube, Yahoo, Gmail), 2 have blue links (Baidu, Wikipedia for now), 4 have mixed links with blue prominent (QQ, LinkedIn, Amazon, Taobao), and one has blue links, but customized by users on many pages (Twitter). It looks like blue links is a fairly common idiom, but not considered mandatory by website creators or universally expected by website visitors. It's not a matter of being perplexed; it's a matter of readability. The current Vector skin has mostly blue text in the left sidebar and mostly black text for the article. This contrast makes it easier for your eye to read paragraphs, because it's less likely that your eye will jump back too far at the end of a line. The proposed new skin does away with that, making the article less readable. They all appear correctly, in both the headings and the page index, on Safari 6.1/Mac, Firefox 25.0.1/Mac, and Chrome 31.0.1650.57/Mac, and on Safari/iOS 5. Improvements for audio usage of the page ? Klipe, I'm not sure what software was used there, but it's definitely not what the most used screen readers (JAWS, VoiceOver and NVDA) would do. They follow what is called the document order, where title and content come before navigational UI components of the website. Actually, it's one of the few areas in terms of accessibility, where we really do stuff correctly. That header? That's a problem. Numbers and underscore looks bad. ja.wikipedia.org is bad. en.wikipedia.org is OK. Personal tools links, tabs, and sidebar links are all grey. 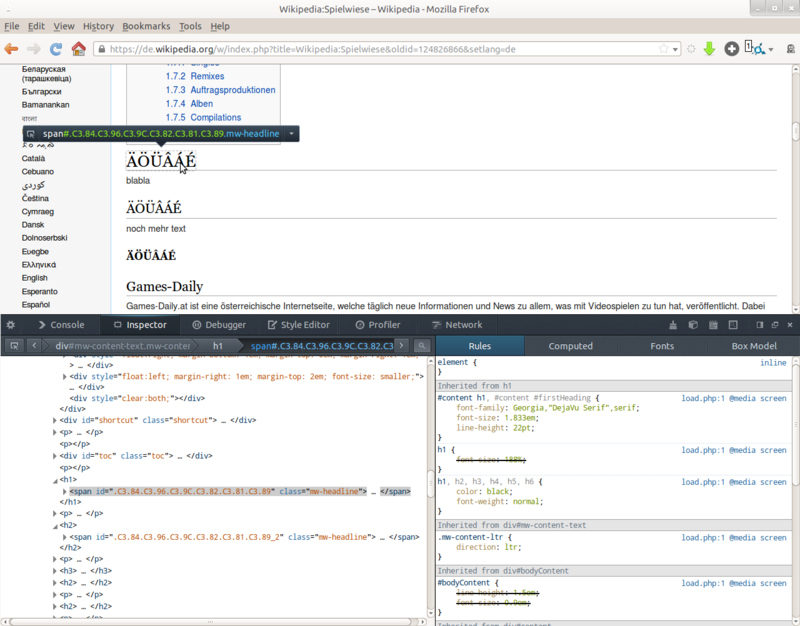 Many sidebar links now include a line break. The layout gets adjusted considerably, beyond just the typography. The sidebar is slimmer, the top of the main content box moves up, the margins change for a lot of the layout elements within the page. Font on interface elements is too small. Text that is not styled is somewhat easier to read quickly, with the extra line spacing, larger spaces between words, and smaller spaces between letters. This page was last edited on 18 January 2019, at 01:39.